Ukraine and March Madness: What’s the Connection? The obvious answer is that they both contain elements of madness. The two together have made up much of my mental life of late, but since the Ukraine problem is so scary while the basketball tournament is so much fun (especially if you are still alive in a pool like me) I’ve been much more inclined to watch basketball than to write about Ukraine. Wow! So many close games going right down to the wire and beyond. It is human nature as depicted in a cartoon I ran across years ago. It shows a guy sitting in his easy chair reading a newspaper with the front page headline: World War III declared! Behind him his wife is asking: “Enough of that. Anything about Brad and Jen?” (I said it was several years ago). The Ukraine situation is scary because tensions are so high, who knows what unintended consequences they might trigger? Like many I imagine, I am particularly concerned with what further incursions besides Crimea Putin and Co. might make in Ukraine near Russian borders under the guise of protecting Russian ethnics. There is very little we could do about that immediately while Ukraine’s own national pride would likely prompt violent reactions there, which while understandable could lead to who knows what? For various reasons I won’t get into now, I don’t think Putin sees going beyond Crimea as being in his own best interests and that is what seems to count most. Since I can do nothing about Ukraine in any event, I will tend to my own best interests right now. And they include Louisville continuing to win right through the national title game a week from Monday. While I can’t prove it, I think my focused willing them to win helped in their first two disturbingly close victories and they figure to need my full attention going forward this Friday. Meanwhile regarding Ukraine, of the numerous editorials and articles I have read over the past couple of weeks, a very recent piece in the New York Times by Michael A. McFaul seems to provide the most illuminating thumb nail sketch of the situation, including its historical context. A former ambassador to the Russian Federation while part of the Obama administration, McFaul provides a good overview of the Ukraine issue linked here. The spirit of the editorial is nuanced and cautious, a soberness that befits the situation. Our madness should be restricted to the tournament that resumes tomorrow. In my post last week I mentioned the complexity of the Ukraine situation and how our ability to apply pressure on Russia is compromised by the degree to which our allies in western Europe depend upon Russian oil and gas exports. Our key ally in all of this is Germany, as it is most vulnerable to economic retaliation from Russia, and the fact Chancellor Angela Merkel was saying little publicly about the situation was indicative of the touchy nature of Germany’s position. I do not think that is just rhetoric. She feels offended by the lengths he is going and wary of where it might lead if allowed to stand. She gave an unusually emotional speech to her own party advocating a tough stand on sanctions a few days ago, despite the economic harm it could do to Germany. Germany is dependent upon imports from Russia for about 25% of its oil and gas and about 6000 German companies do billions of dollars in trade with Russia. Merkel, ever the pragmatist, knows this will be tough sledding for her. Her pragmatic nature is something she had seemed to share with Putin, one reason they have spoken much more often over the years than Putin and other western leaders. And, as one commentator put it, they speak the same language, literally. She speaks good Russian from having grown up in East Germany and Putin speaks good German from his work in the KGB there. Also, Merkel worked for the East German government at one point, so she has a better sense of Putin’s perspective than do other western leaders. That her conviction is that Putin must be punished for his actions even though nations like her own will be hurt in the process seems the most important news regarding the Ukraine’s future this past week. For additional background and perspective I recommend this New York Times article. Obama’s Foreign Policy, Reality and Putin: Enough with the tough talk, already! It is hard to believe Obama is that naive, since we have practiced our own invasions, brute force and great power games in recent years, but let’s not complicate the Post’s simple fantasy of reality just yet. When people talk about reality, they barely get the half of it, not to mention the nuanced complexity revealed when a given situation is truly examined. The reality ignored by the Post is that these countries, at least Russia and China, are integrated into our global economy for the most part. Yes, they rely on brute force, but again so do we. And this being a global economy makes little if anything simple in terms of foreign policy because ramifications abound since we are so interlinked. This limits our options when it comes to taking decisive actions in a crisis like Ukraine because hurting Russia economically, in this case, is also likely to hurt our allies. It is hard for us to get tough, when they have little or no inclination to do so. The armchair warriors seem upset by Putin’s ability to play us as seems the case in Crimea, implying that Obama should be able to act with similar decisiveness. Putin is a brutal dictator with no one in Russia effectively blocking his moves and no international considerations that he is unwilling to ignore for passing glory. He is also acting on his doorstep, so actions are simple to take and, given the historical ties with Crimea, with a sliver of justification. Obama, on the other hand, is constrained by actual relations with many other countries whose interests he takes into account, while about half of our Congress carps at everything he does, including his failing to come through on the “red line” statement in Syria even though they would not back his acting in Congress. They blame Obama for projecting a weak national image, while they do their best to weaken that image with their politically driven propaganda assailing him for being weak. While there are various economic sanctions that we can muster against Russia, much depends on our allies’ willingness to string along because we don’t trade all that much with Russia and some of them do. Germany in particular has a lot of trade with them, but you may have noticed Angela Merkel is not talking tough. She is barely audible at all. 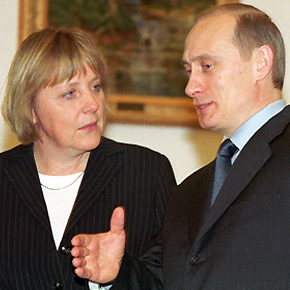 For her to put economic sanctions on Russia is to also shoot Germany in the foot. Along with much trade, Germany depends on Russia for a sizable share of its natural gas which is piped through Ukraine, by the way. Angela is all about letting things cool down rather than warm up. Her inclination is to make a deal and tough talk does not help, it hinders. In short, our options to be tough and decisive are limited because we have gotten mostly past the cold war them-or-us reality to a point of economic integration with the likes of Russia and China. But Putin has remained a law unto himself. He operates with no concern for anyone but Russia and even then is willing to risk Russia’s future for gleaming moments of super power like glory now. Reportedly Angela Merkel has said he lives in his own reality. We have to somehow come to terms with that. If I have persuaded you of nothing else, hopefully you realize how any talk of reality that hinges upon being tough and decisive vs. weak and slow moving in foreign policy is the most dangerous fantasy of all. The U. S., Russia and Ukraine: Recall the Tortoise and the Hare? What is happening in Ukraine makes for very tricky, fast moving business and President Obama is right to move carefully even if his public statements seem weak and indecisive. And yes, even with the Russians publicly stating they will send troops to the Crimean region right after Obama statements about severe consequences if they do so. Russia already has gained control of Crimea through what one commentator has called a “stealth invasion” as can be inferred from daily news reports. Linked here is a brief timeline indicating how rapidly events have unfolded over the past 11 days. Former Ukrainian President Yanukovych was brought down 11 days ago because he nixed an already approved deal with the European union because of economic pressure from Russia, which in turn spurred the protests which prompted the president’s removal and his fleeing east. Eastern Ukraine has much stronger ties to Russia than found in the capital of Kiev and parts west. The Crimea region particularly so. The population is about 60% Russian ethnic background (a majority but not really “most” of the people as I sometimes hear from TV commentators). Also, the region was actually part of Russia until transferred to Ukraine way back in 1954, a which didn’t mean much as long as the Soviet Union remained in tact. In addition there are some 25,000 Russians inhabiting a Russian naval base there, which is of great importance to Russia. This has made it easy for a “stealth invasion” to occur before Russia got around to declaring they would send in troops to protect its Russian relatives. They are already well protected. 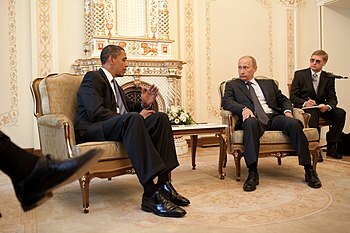 So, Putin has already won the first leg of this race, which of course the likes of Senator McCain and fellow constant critic columnist Charles Krauthammer will continue to lambaste Obama for, perhaps even drawing a false analogy to Hitler and Munich some time soon. Here are two of my biases: John McCain’s first answer to any foreign problem is to get tougher while never complimenting Obama for anything, having never gotten over over losing the presidential race, a position he thought was rightfully his. Krauthamer loves calling the Obama foreign policy clueless implying that he, General Krauthammer would know just how to react to the burgeoning number of international crises though seldom offering suggestions sufficient to reveal his own cluefullness. Fortunately, in a recent editorial the wise one actually made a concrete suggestion for a change, that a U. S. fleet should immediately be dispatched to the Black Sea to show we really mean business this time around. I bet U. S. admirals love that idea. Leaving aside the basic military concern about placing one of our fleets in what is basically a huge lake with only one narrow entrance/exit…. and the likelihood of ratcheting up tensions with unclear consequences…..What would the fleet do once there? How would we act tough? What would cause us to bomb someone or shoot someone down? And if we did, is war with Russia an option? Oh, we could win a war with Russia. That is one of our big problems these days. We have a hugely sophisticated and expensive military that could beat any one in a war, but simply winning wars seldom win the peace anymore. Just what did winning in Iraq get us? For one, an Iran made stronger as Iraq, its ongoing enemy, disappeared as a counter balance (yes, as evil as Sadam was, he had his uses). Then there is the “new Iraq”, hardly a friend and experiencing ongoing upheaval which makes it one more source of instability in the region . And not even any special oil deals. Let’s punish Putin for this latest move, but slowly like a boa constrictor. The Obama team can be criticized for being too optimistic about “normalcy” with Russia given Putin being Putin (or “naive” as conservative critics like to put it), but to act like we are back on cold war footing is silly. We are not about to rattle nuclear weapons at each other, and we do have some mutual interests. The trick is to craft a policy that has some of the good cop bad cop chemistry found in policing. Frankly, the Obama administration hasn’t done a great job of this, but getting our relationships with Russia just right is no easy thing to achieve and those eager to act more aggressively would likely muck things up more, i. e. Admiral Krauthammer. Finally, let’s think about this: Time is on our side. While Putin is parading around for now, Russia is heading towards another economic collapse, which is what led to revolution and the break up of the Soviet Union. Oil and gas (and maybe something else I can’t recall at the moment) are Russia’s only real exports and the price of both are declining. This is a result of new sources being discovered in North America and elsewhere and a lessening world energy demand from developing countries like China, whose growth is slowing. Besides that, only big gamblers want to invest in Russia these days, given the Russian government’s corrupt incursions into the economy. Russia is not a hot spot for world investment except for big risk takers. The critics have all sorts of advice for the president in terms of sanctions on Russia, many of them I imagine the government is considering, but can take time to develop. If military involvement was one of them, time would be of the essence, but it is not. Sure, Putin continues his string of bows and bragging rights, but his taking such decisive steps in Ukraine may work out in our favor. This latest power grab will likely make it easier for Obama to rally support for harsher economic reprisals of Russia over time. And, that could be more powerful than one might expect given that nation’s inherent economic problems. In any case. Getting off to a fast start doesn’t necessarily win the race. Remember the tortoise and the hare?